This chunky crochet cowl with an infinity loop is perfect for winter and as an added bonus, it crochets up fast. It’d be the perfect last minute gift or a sweet winter treat for yourself. Crochet cowl can be worn loose and long or wrapped around your neck twice to keep the winter breeze out. If you’re looking for a smaller crochet cowl, check out this other free chunky cowl crochet pattern here: Heath & Heather. 100 – 110 yards of Super Bulky Yarn. I used 1 skein of Lionbrand Wool-Ease Thick & Quick in Barley. FCH – Foundation Chain (or single crochet): Chain 2. Insert hook in the first of two chains. Yarn over, draw through loop (chain stitch just created). Yarn over, pull through two loops on hook. (Single crochet created). You now have two fch completed. *Insert hook in upper loop of stitch just created. Yarn over, draw through loop. Yarn over, pull through two loops on hook. * Three fch completed. Repeat from * to *across for desired number of chain stitches. HHDC – Herringbone Half Double Crochet. Yarn over, insert hook in next stitch. Yarn over, pull through two loops on hook. (This will be a little awkward, but it’s correct. You might have to use your left thumb and forefinger to really hold the stitches so you can pull through both of them.) Yarn over, pull through two loops on hook. Round 2: Chain 2, turn. HHDC in the BACK LOOP ONLY of each stitch across. (77 HHDC) Working in the back loops only creates a slight ribbed effect. Fasten off, leaving a 12 inch tail. Lay piece flat in a long rectangle. Grabbing either end, bring short sides together. Add a twist by flipping the right side once. Match up sides and whip stitch together. Weave in ends. That’s it – your crochet cowl is finished! Show off your new crochet cowl in JJCrochet’s Customer Gallery or post your project on Ravelry. Love this!!! Really nice pattern and it looks like it works up pretty quickly. Just one question — about how much T&Q did you use? What’s the yardage for this? Or how many skeins?? Glad you like the patterns. It’s so easy and I’ve been making a bunch of them for late Christmas gifts. This pattern requires 1 skein of Lion Brand Wool-Ease Thick & Quick or 100 – 110 yards of any bulky yarn. I’ll update the patter with that info – thanks and happy crocheting! This is soooo pretty! Thanks so much for the pattern! I just finished making this according to your directions and the exact materials… and I should say that in general.. I think I crochet tight. But while my width is 5 inches.. my length is only 44 inches… and it’s not quite long enough to wrap around my head twice… unless I stretch it… any suggestions?? Should I redo it w/ a bigger hook or should I use more yarn? I only used 1 ball. I just love the look of yours… but it’s not quite long enough for me to comfortably put around my neck twice… what would you suggest? Thanks for any help you can give me! I’m glad to hear you’re trying out this cowl. I’d say you can do either of the options you suggested – it’s more of a personal preference. It sounds like you are crocheting a bit tightly so if you want to get a looser gauge, bump up your needle size. OR if you’re happy with the tighter stitches, I’d say to chain 100 instead of 77 to begin with so you have a cowl that fits. Hope that helps – let me know what you decide to do! I’ve just made a similar one that I found on Ravelry and the beauty of that one was the “intrinsic twist” rather than sewn. So quick to make up. One of the users posted a tutorial to do the twist (I made a bracelet to practice) and its super easy. Essentially your pattern works from the middle out to the top/bottom and you do double loops before you get back to the beginning. Have a go. Oh, very interesting. Starting with an “intrinsic twist” would certainly make crocheting the cowl easier to finish. I’ll certainly have to look for that pattern on Ravelry and try it out – thanks for the suggestion! Just starting to make this and am a little confused, I’m a very basic crocheter! It says not to join the chain 77, then it says round one. How do I work in the round if I haven’t joined it? Wouldn’t that be a row? Probably very obvious! Thanks so much for your help and sharing the pattren, it’s a very pretty scarf! Yes – You’re correct. Technically it would be a row, not a round, because you never join it. Good catch! Ha, Kristy – I’ve certainly had the “have to crochet that NOW” urge. I know exactly what you mean! I’m glad your cowl turned out great – I’d love to see a picture if you get the chance. http://jjcrochet.com/blog/customer-gallery/flaunt-it/ Keep on crocheting! Ok I did that so you can see! I was also looking at your etsy shop and I really like your little red ridinghood hat that has the little butterfly detailing on it! I was wondering if you are selling that pattern because I love making unique hats! Plus they crochet so fast! Can you use hometown yarn for this scarf? would it still be 1 skein? I am a total novice….thanks!!! Hi Meredith! You can certainly substitute Lionbrand’s Hometown USA yarn for this pattern, but you might use a bit more over one skein. The yarn is bulky enough, though, and would be a perfect substitute to use for this cowl. Let me know how it turns out! I’m confused by the HHDC, that sounds like a regular double crochet to me. Am I missing something? The HHDC is a mix between a double crochet and a half double crochet. You yarn over, insert your hook through a stitch. Yarn over, pull through two loops (as opposed to one loop for a regular dc), yarn over, pull through two loops. It’s a little funky since it’s a different stitch, but it gives a great texture. Hope that helps clarify things! Thank yot for this lovely pattern! My question is, how long this cowl is? Hi! Love the pattern, made one for a gift. I’m getting ready to stitch together, but am confused about the very last line, stitching A to B instead of A to A, etc. Could you please elaborate? 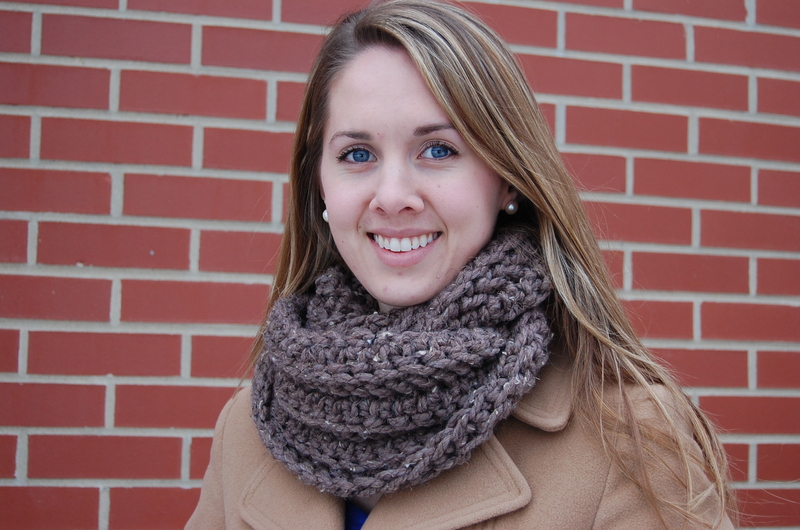 Hi Krisztina – The finished cowl measures 48 inches long by 5 inches wide. You can certainly substitute any chunky yarn and I think you’d still be able to crochet a beautiful cowl. Julianne, the last part that gives stitching instructions is how you get the “half-twist” into your scarf. You can sew the cowl together “A to A” like you normally would, and you’d end up with a basic tube. But by twisting the cowl once and THEN sewing it together, it’ll allow the cowl to lie flat and be nicer for the wearer. The “A to B instead of A” part is the best way I knew to spell that out. Just think of it as purposefully sewing a “twist” into your cowl – maybe that will help? Good luck – let me know if you figure it out! The cowl is just gorgeous. I am trying to teach a friend proper stitches and techniques but I’m still confused on the HHDC … I did the stitch per your instructions and it is just a basic double crochet stitch. Isn’t a half double: yarn over, insert into stitch pull up a loop, yarn over pull through all loops on the hook? HELP …. Let me know if that helps! Have fun! Thank you Jayna for this wonderful pattern. Was wondering if you have seen it made with a little thinner yarn and would it look as good. Hi Danielle – I haven’t tried making the cowl with a thinner yarn, but I would think the same texture of stitches would be there, just less pronounced. If using thinner yarn, just make sure to chain more when you’re starting out so your scarf so it’s big enough to fit. If you end up experimenting, please let me know how it turns out – I’d love to see pics! I learned how to crochet for the first time in one weekend and made two of these scarves! Well… Sort of. One I didn’t do the back loop in but it still looks fine. The other is ribbed and is really narrow, but I’ve run out of yarn. Oh well. I’ve been trying to figure out how to join them together with a whip stitch, but since they’re not straight edges, I’m worried if I try then it will look super messy. Are there any other combining stitches you could recommend? thank you so much for offering this pattern! i chained 100 instead of 77 because i wanted mine just slightly longer and it turned out great. it worked up super quick and was so fun to do for my first bulky yarn project! I started crocheting a month ago and for my 2nd project, I wanted to try out your pattern. I’m using a different yarn, 2 skeins combined but still thinner than a super-bulky. i’m also using a smaller hook, a 10mm. now my problem is the length… i’m about to start on my 2nd balls of yarn and i’m not sure if it will be long enough to wrap around. i tried pinning the ends temporarily so i can try to wrap it around my neck, and i think i’m kind of stretching it. although it fits snugly around my neck, it’s only stretched a bit when i put it on. Isn’t it great learning a new stitch? Glad you stopped by and found something new, Colleen! Thanks for this wonderful pattern and introducing a new stitch to me! I really want to try making it. I’m just a little curious though. I’ve seen people do foundation chains with double crochets or half double crochets as well and I wondered if a herringbone half double crochet foundation chain is possible too. I’m just not sure since the stitch works slightly differently than other ones. Interesting question, Lily. I’ve never tried to do a foundation chain using the herringbone half double crochet, but it could be possible. I think it’d turn out something like the half double crochet since the two stitches are so similar. Hi I just love your Cowl, it is so beautiful. I bought some Lion Brand yarn Thick & Quick only to realise I have a 9 hook. I have no way of getting to the store to buy a bigger size hook. What way should i adjust pattern. Please help?? Thank you so much, I really want to make your cowl it is so beautiful. I think the problem people are having with the hhdc is when you pull though the loop, the first one you pull through one loop, then you yarn over and pull through the 2 remaining on the hook? Hope this helps. This infinity scarf is wonderful. My sister has this kind of scarf, but it is not an infinity scarf. To have this kind of pattern to an infinity scarf is really good, since the fabric is very helpful in terms of keeping you warm in the cold season, and you can loop it around your neck.